A track saw is not just a circular saw that is used with a fancy straight-edge. The track saw slides along a unique track that guides it. Unlike a straight edge, the guide keeps the tool on a straight path. It cannot wander off the cut line like a circular saw with a straightedge can. The underside of the track is rubberized, so it does not slip easily. This means that most cuts can be done without any hold down clamps. You just align the edge of the track to the line, place the saw on the track, and cut. Unlike a circular saw, the blade guard is secured to the base of the track saw. The saw is hinged to the baseplate, and you press it down to cut. The track saw does not have a spring-loaded blade guard that closes the cutting half of the blade. When resting, the saw blade is raised, and the blade edge sits above the base of the tool. The blade is entirely retracted and cannot harm you. The blade guard edge is really close to the work surface, so it has the advantage of removing almost all the sawdust. Some folks call it a plunge track saw or merely, a plunge saw. When you use it, you press down on the saw, and the blade plunges down to your pre-set cutting depth. Because of its design, it is the best saw to cut an opening in a panel. Apart from marking the cutout, no preparation is needed. What are track saws used for? A track saw is the best tool to cut 4×8′ sheet goods unassisted. It is used for cutting sheets of plywood, medium-density fiberboard (MDF) and other sheet goods. It excels in long straight cuts, and only the best table saws can match the quality of its cuts. A track saw will deliver clean and splinter-free cuts on any type of sheet because of its chip guard. Because every cut is a finished cut, there is no need to do a rough cut first. A method often used when using a circular saw. The circular saw causes tear-out, a condition where the blade catches the veneer or top layer and rips it unevenly. Tear out marks ruin the look of your project. It sets up quickly and accurately, and when handling large sheets in a small space, the track saw is your best solution. With a table saw, the large workpiece is moved through the cut, so you need space for the sheet before and after the saw. A track saw moves when cutting. If you have space for the sheet, you can cut. After the reviews for my picks for the best track saw, I’ll compare the track saw to a table saw — it’s an interesting comparison that many people are curious about. 60V MAX, 6-1/2″ : Best track saw if you want the convenience of cordless. The FlexVolt system gives you the freedom to work anywhere. DeWalt is a respected brand, and their tools have a good reputation for quality. The DeWalt DCS520B is no exception, and this track saw looks the part. Its cast aluminum base and solid guard looks robust. I believe it will last for a long time, deliver excellent service and remain as accurate as when it’s new. The DCS520B is used with the TrackSaw(TM) dual-edged tracks. The tracks are not supplied with the 520B, but I highly recommend buying it with the saw. When used with these tracks, the DeWalt makes clean, perfectly straight cuts every time. The edge of the track is where the cut happens, you just align the edge of the track to the cut line for a precise cut. Another advantage is that it aids in making splinter-free cuts. The DeWalt DCS520B is cordless (battery-powered), but it delivers the same cutting power as the DeWalt corded saw. It uses the Flexvolt 60V, 6.0Ah battery that’s paired with a brushless motor. The Flexvolt battery can be used with any of their 20V, 60V or 120V MAX tools. The extra power enables the DeWalt to cut hardwoods effortlessly, up to 2-1/8″ thick. On the track, the cutting depth is 2-1/8″ at 90° and 1‑5/8″ at 45°. It will power through any sheet, and it’s a great track saw for professionals. If you already own any of the FlexVolt tools, the 620B model will suit you because the battery is not sold with the saw. The Flexvolt system has the advantage that older 20V tools can use it, with up to 4-times longer runtime. The thickness of the track is factored into the depth-of-cut scale, so you know exactly how deep the cut is. The depth of cut setting is a great aid when doing plunge cuts and when cutting floorboards. It has a spring-loaded riving knife, which rides inside the cut so the sheet cannot pinch the blade. In doing so, it prevents kickback. The low profile saw guard ensures excellent dust extraction. You can attach an extractor to its 1-1/4″ dust extraction port, and it will remove 90% of the sawdust. This a great advantage because some sawdust is harmful. It also keeps the cut line clean and makes for a cleaner shop. The blade diameter is 6-1/2″ in diameter. When buying a new blade you have to keep it in mind, some track saws use a 6-1/4″ blade. The DeWalt DCS520B has a bevel capacity of 47°; this enables you to undercut a bevel. It’s sometimes done to improve the fit of an angle. Setting it to any angle is quick and accurate due to the clearly marked gauge. It’s a real time saver, you can easily set the angle by aligning the pointer with the scale. I remember tools that forced you to do several cuts to set the angle right. Delivers straight, splinter-free, precise cuts. The speed can be regulated between 1750 and 4200 rpm using the speed-setting wheel. This enables you to adjust the cutting speed optimally to suit the material type that you’re cutting. A chart listing material types to speed range is provided in the manual. It’s a good starting point for most cuts, and it will ensure that you get optimal results. The DCS 520B carries a 3-year limited warranty from DeWalt. DeWalt manufactures excellent tools that always please, and they have service centers everywhere, so you’ll never be inconvenienced. With its Flexvolt battery, it’s easily the best battery powered track saw on the market. One of the best Track Saws for the money. Professional-grade tool. High-quality saw you can depend on. 9 blade types available, TS saws can handle nearly any surface providing optimum results. ✓ View or download the MANUAL for the Festool TS 55 REQ-F-Plus (575387). Festool is a German company with a history going back 90 years. They operate in 68 countries and employ over 2700 people. Festool is well known for their quality products, and with 955 dealerships in America alone, your nearest service center is always close. The Festool micro-adjustable depth controls make setting the depth of cut precise. You can set the cutting depth between 0 and 2-1⁄8”. To aid in making sure that the depth setting is accurate, Festool makes it easy to adjust the cutting depth scale with an adjuster. This feature makes it quick to set the gauge for sharpened saw blades. It’s especially handy when moving from on-track cutting to cutting without a track. Because of the 6-1/4″ blade, the cutting depth at 45° is 1-11/16” maximum, and at 0°, it’s 2-1/8”. Considering that this tool will be used to cut sheet goods, the cutting depth is more than adequate. It will never leave you thinking that it needs a bigger blade. A spring-loaded riving knife (splitter) keeps the cut kerf open. It can be locked out, but when used, it slides inside the cut. This stops the material from pinching the blade, reducing the chance of kickback. It’s an excellent safety feature found all of the best track saws. It may sound silly that a saw that cuts so straight needs a riving knife. But, on long cuts, the back-end of the work can close up and pinch the blade. The TS 55 Req-F-Plus track saw is a corded track saw. It has a powerful 1200-Watt motor, and the speed is electronically controlled, so the motor speed remains constant. This ensures a uniform cut speed even when under load and when cutting knotty pine. The advantage is that you always cut at the most proficient rate for the job at hand. Using the adjusting wheel, you can regulate the speed in steps within the speed range. A speed-setting guide for different types of material is in the user manual. A guide like this cannot be accurate for all conditions, but it’s a good starting point. For easy arbor bolt removal when replacing the blade, the Festool has a “FastFix” system that locks the switch and arbor simultaneously. When the blade is entirely down, the system holds the guard in place to make the blade changeover easier and safer. The Festool TS 55 works best with the FS 1400 Guide Rail, which is 55” long, the cut length is up to 49 inches. You can always add more guide rails to extend its range almost indefinitely. Non-skid, dual-clamping rubber support strips prevent movement while cutting. When used without clamps, it significantly saves on setup time, but for long cuts, it’s better to clamp the guides. Two green guide strips on the cutting guide reduce friction between the tool and guide rail. It makes the cutting action effortless and fluid. The tool really slides through sheets effortlessly and delivers almost perfect cuts with only a few tiny, almost invisible chips, slightly better than a table saw. You can connect a mobile dust extractor that fits a port diameter of 1-1/16″ to 1-7/16″. Track saws are known for their dust removal qualities, and when using a dust extractor, it’s close to having an entirely dust-free environment. Exceptional saw. Smooth and accurate cuts. The Festool TS 55 can be set for a bevel angle of -1 to 47 °, allowing for undercutting at angles. This makes it possible to match cuts done with another tool that was not accurately set. It’s seldom used, but the setting scale is accurate, and therefore changes are quick. The 30-day money-back guarantee and a 36-month comprehensive warranty protect your investment. Festool guarantees ten-year parts availability with free shipping within the first three years. Should the tool need repairs, they guarantee that a standard repair will be done within 48-hours. Owners rave about the Festool quality and ease of use. I know Festool products, and I will always recommend them with confidence. I consider the Festool to be the best track saw in this line-up. Enough power to cut though hardwoods, & common construction materials. ✓ View or download the MANUAL for the DeWalt DWS520K. The DWS520K 6-1/2″ TrackSaw kit has a 12A, 1300W motor that will let the machine power through hardwoods up to 2-1/8″ thick. Used on a track, it is an accurate, safe and convenient plunge cut saw. Except for the motor, the machine is identical in design to the battery-driven DCS520B model. Both are powerful and robust machines. 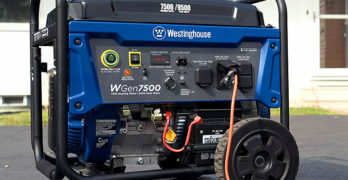 Many will prefer the battery-powered model for its versatility and ease of use. Unfortunately, the battery models are a lot more expensive when the cost of battery and charging system is included. If you decide that the cost of a battery system is too high, you will not be disappointed by this model. It is lighter and slightly smaller than the battery model and perfectly balanced. The riving knife provided with this saw is marked with its thickness – 0.067″. This riving knife should only be used for blades with a 0.087″ minimum kerf width and 0.063″ maximum body thickness. The blade supplied with the circular saw is the correct size for the riving knife of the saw. If a different blade is used, check the blade body (plate) thickness and the blade kerf (cutting) width, which is usually marked on the blade. DeWalt is an American brand with a worldwide footprint, known for their excellent power tools and hand tools. DeWalt has seven factories in the US. Their warranty covers the machine against faulty materials or workmanship for three years from the date of purchase. It can be returned within 90 days from purchase, for a full refund. DeWalt is a respected US brand, their tools are of good quality, and the support is as good as you can expect. Why wait? It’s less expensive than the battery model, so you’ll have some extra cash to buy a few extra tracks as well. Only fit the best quality precision blades that are manufactured for a track saw. Any blade that vibrates or “spreads out” will damage the track and deliver a poor quality cut. When buying a blade, be sure that the kerf size is within the specification for the saw. The kerf of a blade refers to the width of cut a saw blade makes when cutting wood. The riving knife must also be matched with the kerf of the saw blade. The riving knife thickness must be wider than the body thickness and less than the kerf width. Clear instructions will be available in the user manual. Do not cut metal, masonry, glass, masonry-type planking, cement board, tile or plastic with a track saw. It will ruin its cut quality. It often happens that hardened gum builds up on the tips of the blade. Kerosene, turpentine, or a good oven cleaner removes the hardened gum so that the blade delivers clean cuts again. Anti-stick coated blades are available to reduce build-up and may be considered when cuttings stock that creates a build-up of gum. Even the best track saw with the best blade, will not deliver a clean cut when the tips are gummed up. When a track saw is used to cut sheets of wood, the work must be supported in such a way that the blade does not cut into the worktable. I use a layer of rigid foam insulation to support the workpiece for ripping and crosscutting. When the foam is cut too severely by repetitive use, it’s cheaply replaced. 2X2’s can also be used to support the sheet, arranged so that the supports are not cut. The blade must only plunge below the workpiece by about half a tooth depth. It not only ensures the cleanest cut but also doesn’t cut too deep into the workpiece support. The blade tips of tungsten tip blades are brittle. Metal objects like wire or nails can cause tips to crack or break. It is therefore essential that the workpiece is free of metal pieces. When cutting floors be very careful not to bite into fasteners of any sort. When cutting thin offcut strips, ensure that the narrow strips are not picked up into the inside of the blade enclosure. It will become stuck inside the guard and may cause the sawdust to clog the inside, creating friction on the blade. ALWAYS use the track when plunge cutting, the track ensures that the plunge cut happens straight and safely. When plunge-cutting, hold on firmly to the track saw with both hands to ensure that it stays in place, and plunge slowly. I also recommend clamping the tracks. Does it replace the table saw? I use the track saw whenever I can because it’s easy to use and quick to align. It does not replace the table saw entirely. I find that I mostly use my table-saw for crosscuts or miter cuts and the track saw for full-size sheets. It’s a lot easier to use my table saw for ripping short lengths. The table saw has the advantage that you can set the fence for repeated cuts. When you use more lumber than sheet goods, a table saw is a better option. The track saw is best for cutting sheet goods, and if you mostly do cabinetwork, it’s unrivaled. If space is limited, the track saw is the winner, it does not require the long lead-in and out space needed for a table saw. The track saw is the tool to take with when doing an installation, to cut floorboards and for cutting panels. It’s a lot more compact than any table saw. There’s no need to worry about outfeed space. The saw is moved along the cut, and the longer workpiece remains stationary. It’s unable to mill (rabbets, dados, etc.) as the table saw can. To make it easier when pushing large sheets across a table saw, many of us first do a rough-cut with a circular saw first. Then you have to do a second finish cut using a table saw. With a track saw, the first cuts are your final cuts, every bit as straight, smooth and accurate as you’ll get on a table saw.